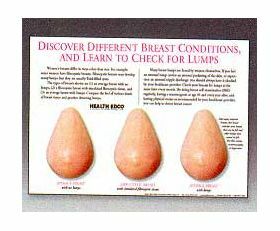 Realistic anatomical models of three breasts that allow you to feel the difference between an average breast without lumps, a fibrocystic breast, and an average breast with lumps. 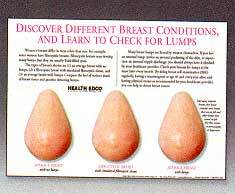 Breast models are permanently mounted on a sturdy Plexiglas display board. A wire easel is included. Size: 13 1/4' x 18 1/4" Suitable for OB-GYN, general anatomical study, training for breast self exams, surgical dissection, or for patient education/demonstration of procedures. Ideal for OB-GYN professionals, midwives, science teachers, healthcare and medical/anatomy educators, medical students and other healthcare professionals. May be used as instructional aids for public service organizations, e.g., American Cancer Society, Breast Cancer foundations, and other medical awareness and support groups for public instruction.